Cincinnati offers more award-winning restaurants and dining venues per capita than any other US city. The city of Cincinnati is particularly famous for its chili, especially its popular 'three-way' chili, which combines spaghetti, chili and cheddar cheese. Skyline Chili enjoys a cult-like following in Cincinnati and German cuisine is also a highlight, with many German taverns and restaurants serving up delicious food and beer, while Cincinnati's riverboat restaurants are always extremely popular. Most visitors staying in Cincinnati tend to have breakfast at their hotels, or at the numerous cafés and other diners that open early for breakfast, especially in and around the downtown and university areas, which cater mostly to students and the business crowd. Meanwhile, most Cincinnati restaurants open for lunch and dinner, with many places staying open late, especially on Friday and Saturday nights. With its German heritage, Cincinnati is not short of pubs or taverns and visitors are able to sample a wide range of boutique and traditional beers. Around Main and 12th streets in the downtown area is where the city's nightlife is concentrated, while Mount Adams also boasts some lively bars. Cincinnati's more expensive restaurants offer extensive wine lists. Breakfast joints are concentrated in downtown Cincinnati, with a good range of cafés, bakeries and diners serving up traditional breakfast favorites for the morning crowd. Many offer daily breakfast specials, while the Walnut Street area is popular among business people due to its proximity to I-71; several establishments serve breakfast all day here. Cincinnati's Coryville district is home to numerous cafés and diners that attract local students. 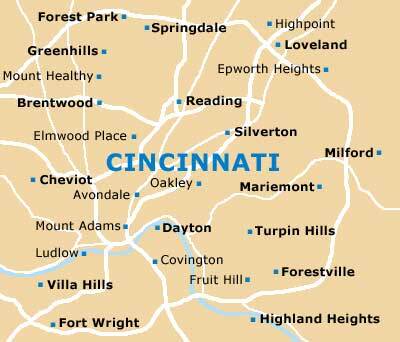 Popular eating establishments are scattered throughout Cincinnati and you will find concentrations downtown a well as at Mount Adams and Coryville. 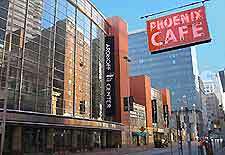 Downtown is home to some cheap eateries, including food courts and inexpensive dining options, while the Skyline Chili franchise at 1007 Vine Street is packed at lunchtimes. Cincinnati dining comes into its own in the evenings, with a huge range of world-class restaurants serving up cuisine from around the world. Upscale French restaurants offer extensive wine lists and exclusive surroundings, while German cuisine is also popular in Cincinnati. The Mount Adams area is home to hip restaurants, while the rich head for Cincinnati's Hyde Park or Indian Hill districts.